The fastest teams and individual 'wildcard' runners from the Cathedral Pyramid Tournament headed to Crigglestone ARLFC to race against the winners of the rest of the Wakefield Pyramid of schools. Every athlete showed grit and stamina as they powered around the long, muddy course. We are extremely proud of all runners (see 'Cross Country 2018' for details) and their achievements. Special congratulations goes to the year 6 girls' team who have made it to the West Yorkshire round of the competition! After a shaky start in the first game, The Mount's rugby team pulled together and performed brilliantly throughout the rest of the tournament. There were some excellent tries from Kenzie, Ellie, Harry and Alex and the whole team demonstrated their defending skills by making some fantastic tackles. All the games were close (with only one or two tries difference in the end score) but despite only winning one game, the team never gave up. Their resilience was admirable and they should be very proud of their achievements! Years 3 and 4 were invited to a rugby tournament at Wakefield Trinity. They played brilliantly, had great fun and showed great sportsmanship in all their games. After the action-packed friendly tournament the team had the honour of bringing out the Sky Sports flag for all the Wakefield Trinity spectators to see. They even got to meet some of the players! Following on from the great work put in by year three and four, Violet Class brought their silky-skills and game-heads to the competition that they've been looking forward to since they started in year 6, and they didn't disappoint! The girls put in a great team performance won two of their four games. They finished 3rd overall. The boys also put in a fantastic performance showing both incredible individual and team skill. They won all of their games, scoring 14 goals and only conceding one! Eight boys and eight girls from Blue and Green Class headed to the Wakefield Football Centre to take on the other pyramid schools in the 7-aside competition. The boys showed skill and worked well as a team. Winning three of their five games. They finished third overall. The girls were not as confident at the start, but pulled together and showed great resilience and teamwork. By the end of the tournament their skills began to shine through and they also finished in third place. After winning the pyramid competition, the mighty Mount team went to Slazengers Hockey Club to play against the winners of all the other Wakefield pyramid competitions. All the competitors played brilliantly, but against tough competition we came 5th place. The Mount put in incredible individual and team performances, and won all of their five games. The team effort and individual skill was outstanding, so much so that The Mount scored 19 goals in total and only conceded 1! This means that The Mount won the tournament and brought the trophy home. This year's netball was split into two pools. The Mount came second in their pool - winning, drawing and losing a game. There were some terrific skills demonstrated by all the players who scored some great goals, defended with passion and worked extremely hard to get the ball to their shooting end. In the next round, it was a close match between The Mount and Flanshaw, but The Mount were to lose 4-0. Congratulations to Flanshaw who were the overall winners of the tournament. With a mixture of track and field events, The Mount's boys showed off a range of athletic skills in this tournament. The competitors took part in a range of throwing, jumping and speed challenges. The event ended with the relay races where all of the athletes pushed themselves and showed fantastic teamwork and sportsmanship. Overall, The Mount did extremely well and with a combined score of 108 the boys should be very proud of achieving second place (only 8 points behind the winners!)! Congratulations to the 25 children from years 4, 5 and 6 who took part in the Local Schools' Cross Country Tournament. Overall, The Mount came 2nd due to excellent individual and team performances. Year 4: Lia - 1st place! Qualified for level 2 competition: Lauren, Lia, Eoghan! Year 5: Jessica - 1st place! 2nd place, Rehan - 3rd place! Issac, Greyson, Rehan, Millie, Kiera! Wow! What a fantastic fortnight of sports we have had. We've learnt new skills and tried new sports; we've competed against our class mates, and other year groups; we've used teamwork to challenge our opponents, and created a whole school performance. Violet Class (Year 6) have learned how to be sports leaders, so they could run the KS1 competition. The Mount is extremely proud of our running champion, Jessica, who finished an incredible 31st place out of nearly 350 of the country's best runners. This fantastic feat has now upped Jessica's West Yorkshire ranking from 8th in her age group to 4th! Wow! Not only did she achieve personally, but her incredible performance also contributed to West Yorkshire's victory - West Yorkshire was the winning county! Well done Jessica and all of the West Yorkshire runners! This year's Sportability Tournament, where a range of different sports are played, such as 'seated balloon volleyball' and 'new age curling', was a fantastic event. The competitors tried out new sports, competed against other schools and had lots of fun! Overall, The Mount came in 3rd place. Well done! Fancy footwork, tactical play and super teamwork was evident throughout both the boys' and girls' football competitions. Athletes on both teams showed grit and a desire to win whilst having lots of fun and making sure they played fairly. After some great performances and some close matches, the boys finished in fourth place. Some fantastic newly-acquired skills were demonstrated by the girls and they achieved a very well-deserved second place. The cross country athletes didn't disappoint when they demonstrated excellent stamina in this year's cross country event. There were great individual and team performances and all the competitors should be very proud of both their performances and the way in which they represented our school. At The Mount we work hard in P.E to become fit, healthy, talented athletes. Our Sports Fortnight has been action-packed! World Cup Football Tournament against local schools. We won the trophy, playing as Brazil! What a fortnight it's been! We've tried (and loved!) some new sports; competed against others; performed a whole-school dance; and challenged ourselves to make sure we perform at our best. Well done to every single one of you! Still to come...WHOLE SCHOOL SPORTS DAY on Friday 6th. Who knew skipping could be so much fun? 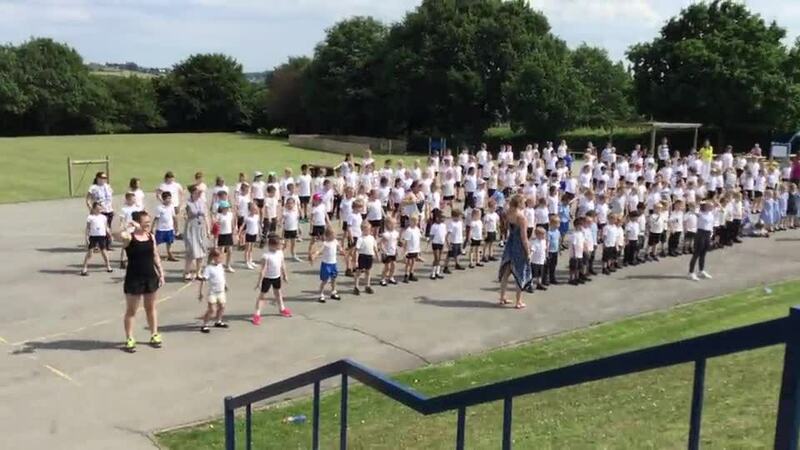 On the 24th January, the whole school took part in skipping workshops. We learned new skills; realised how fit it could make us; and above all, had loads of fun! All the staff had a workshop after school too. Hopefully we'll see everyone out skipping on the playground at some point! This year's tag rugby competition was hosted by The Mount; what a treat it was for the spectators! Every player on the 10-person squad showed skill, enthusiasm and a desire to win. It was a real team effort with everyone making fantastic tackles and preventing the opposition from scoring. But The Mount didn't stop at defending, they also scored plenty of tries - resulting in four wins and a draw. Everyone competed to the best of their ability; there were some outstanding performances. Well done Key Stage 2! Thank you to Cathedral Academy for lending us some of their sports leaders to help the competitions run smoothly. What fantastic performances! The finals began with the sprint races; followed by distance; then hurdles; and finished off with the relay. Each finalist demonstrated determination, athleticism and sportsmanship in their event. Everyone should be extremely proud of their efforts! Thank you to the athletes' parents and guardians for your support in this event. The Mount couldn't be prouder of the Jessica, Emily, Ellie and Kadie, who braved torrential rain and squelchy mud to compete against 150 of West Yorkshire's very best runners. All four of the girls showed what resilience they have by braving the elements and running their hearts out. Each one of them should be extremely proud of their achievements! Special congratulations to Jessica who has qualified for the all England Finals. Playing on one of the best pitches in the north, The Mount charged around Wakefield Hockey Club's superb water-based astro-turf pitch showing great skill and speed. The Mount finished third, with three wins and a draw. Well done team! A great big thank you goes out to one of The Mount's past sports stars who is now responsible for developing rugby provision for primary children and girls in the Wakefield area. Four teams from The Mount took part in this fantastic tournament held at Eastmoor ARLFC. A great afternoon, full of fun and energy, was had by all! Feeling inspired after the England Netball ladies battled their way to win the 2018 Commonwealth Netball Tournament, The Mount took to the courts. With some incredible skill shown throughout the court, the team romped their way to first place. They are looking forward to the next level of the competition in March. The competition began with the boys event. They demonstrated a range of athletic abilities in both the field and running events. All the boys did incredibly well and showed a true determination to win. Highlights included two of the boys ( Mason and Haris) jumping over 5 metres (!) in the triple jump, and the 6 lap parlauf race which we drew with St Michaels. The girls also finished in second place; but with The Mount School's combined boys' and girls' scores we finished joint first place with St Michaels!! Well done to everyone who competed! Due to a residential trip, not all qualifying athletes from the district competition could attend this round. But our Year 5 stars travelled to Temple Newsam to compete against the best runners in the county. Jessica put in an incredible performance and came 7th in her heat - she will now compete in the ENGLAND(!) finals in Loughborough. On a cold, snowy February afternoon, ten brave athletes travelled to Outwood Grange Academy for the Wakefield District Cross Country Competition. All the competitors showed brilliant resilience as they were running not only a long distance race, but were battling against the elements too! Each athlete demonstrated stamina and skill as they powered around the slippery course. Some of the races had 50 runners, and The Mount did a fantastic job at keeping up with, and in some cases, leading the pack. All the children who finished between 1st and 10th place have qualified for the West Yorkshire round of the competiton. Following on from the boys' success, The Mount's girls demonstrated how they've developed as athletes over the year. Every competitor put 100% effort into their events and demonstrated fantastic determination to do their best for their team. The girls' combined scores put them in fourth place. It was Year 4 representing The Mount at this year's dodgeball tournament - and what a fantastic job they did! Winning four out of their five games, Blue Class should be extremely proud of their performance. Each year was able to experience three different sports during the fortnight: dance, rugby and martial arts. Some of us loved the experience so much that we are going to see if we can join these clubs! Orange and Yellow Class showed energy, enthusiasm and skill when they were treated to a fantastic afternoon of sport, planned and run by Violet Class.